Cal baseball’s rising junior Andrew Vaughn has been named a finalist for the Golden Spikes Award, USA Baseball announced Wednesday. In addition to Vaughn, Auburn pitcher Casey Mize, Florida pitcher Brady Singer and Texas infielder Kody Clemens, all of whom were recently selected in this year’s MLB draft, were chosen as the other three finalists. 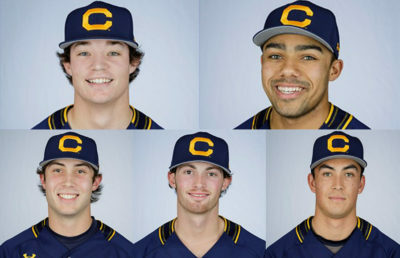 The Detroit Tigers selected both Mize and Clemens with the No. 1 and No. 79 overall picks, respectively, while the Kansas City Royals took Singer at No. 18. Vaughn, who has yet to complete his junior season, was ineligible for this year’s draft but will be eligible next year. On paper, Vaughn had a better statistical season than did Clemens, besting him in almost every major offensive category, but Clemens has the benefit of playing on an elite Texas squad that is currently pursuing a national championship. In three postseason games, Clemens is batting .500 over 14 at-bats with a pair of home runs, both of which came against Texas A&M. Should Vaughn win the Golden Spikes Award, he’ll be the first player in Cal history to do so and the eighth player in Pac-12 history.